Amelia Kruse could stand in any room, and I'm fairly confident eventually everyone would gravitate toward her. She has a gentle, positive and thoughtful way that draws out a more open and introspective side of you as you're chatting. In a city that can feel quite tough sometimes, she's a welcome change in energy. Amelia was formerly running People Insights at Refinery29 when she naturally found herself mentoring the women at the company, then furthering that interest through study and ultimately establishing her Leadership & Transition Coaching practice. She now meets with clients at different life stages and choice points in life. 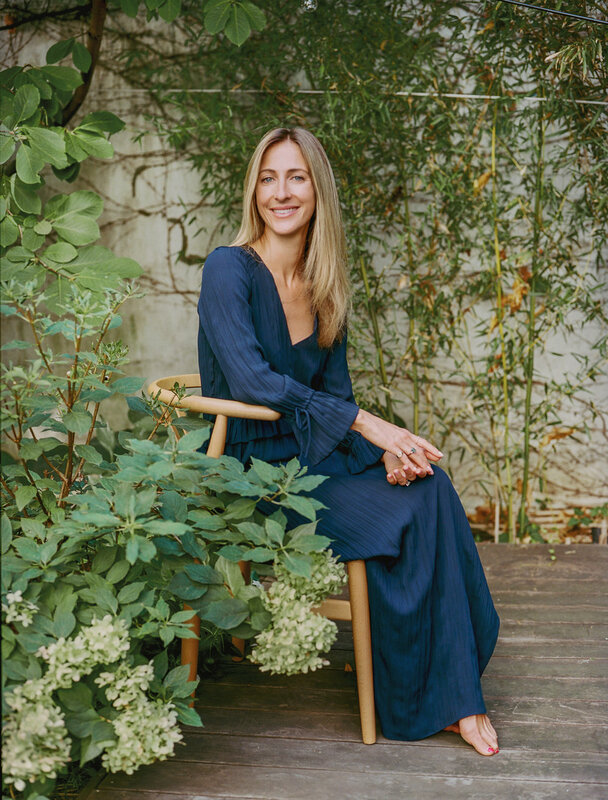 Since many of us find ourselves navigating changes in our careers and relationships, Amelia shared her in-depth perspectives on some of my personal questions about the value of coaching during the transition into motherhood - specifically building a strong inner voice to manage the inevitable identity shifts, comparison culture and unsolicited advice more confidently. I hear a lot about coaching in the professional context, what are the other applications? How do you see it of value to new mothers? Coaching is about building and maintaining a strong core that is authentic to who you are and who you want to be in this world. Specifically, coaching helps new, seasoned and expecting moms move through motherhood transitions and reach their potential not only as a parent but as a unique individual who has multiple important roles in life. The most important thing to realize is that we are all different. We have unique minds, unique ways of seeing the world and unique methods of understanding and analyzing our environment. Taking advice from others can help (when it is asked for!) but it is immensely more important to build a strong core that allows you to believe in and listen to your own knowledge and intuition when dealing with new challenges and transitions. Coaching also helps moms prioritize their own well-being and the well-being of all their relationships. The idea of a core is compelling as it feels very grounding and secure. Can you spell out what it means and how it impacts our day to day? A strong core is about having deep self-awareness and emotional intelligence (EQ). Self-awareness is not only about understanding who you are, what your values are, your strengths and weaknesses, but how to leverage these core aspects to figure out and fulfill your dreams in a way that is authentic to you. Once you're on a path of discovering and building self-awareness, having a high EQ is key to living in the outside world peacefully and bringing your core to life in whatever situation you find yourself in. Whether that be learning how to breastfeed, living off no sleep or dealing with the crazy hormonal changes, this core of self-awareness and empathy will provide you with a foundation to better navigate this new transition. EQ is about being able to understand where others are coming from and to manage their emotions effectively - to not only be able to put yourself in another’s shoes, but to see how they walk in those shoes and have respect for it. Self-awareness and empathy are key to dealing with whatever challenges cross our path and to see those challenges as opportunities to learn and grow from. Having empathy for those around you during this transition will help you to see their actions in a more positive light and to deal with them in a more effective way. If, for example, you feel like your partner isn’t helping you as much as he should or if your mother-in-law is giving you unsolicited advice, it allows you to see where they may be coming from and to manage your response to your own emotions as well as theirs, more productively. Having a strong core builds self-confidence and an internal calmness that radiates from a person in the form of positive energy. And the more positive energy we have the more positive energy we attract. We know now babies and children (and adults for that matter!) all pick up on our energy intuitively and take it on. So if you are stressed and coming from a place of self distrust, your baby can pick up on those feelings. What goes into building that core and internal sense of self and clarity? Exploring what you truly want in life for yourself, and who you want to show up as for your child and partner is the foundation. Knowing what your next step is, whether that’s focusing this time on motherhood, going back to work or starting something completely new, comes from inside you, not from external influences and other people. To be able to hear your inner voice louder and clearer than all the other voices around you and being able to act on it authentically, is a result of building a strong core. Coaching encourages the exploration required to forge a path that is authentic to them and who they want to be as a mom, a wife, a professional and a unique woman. With coaches, mothers can get at the heart of what’s driving the fears and negative thinking behavior that is causing specific issues to turn up in their life. This allows them to more effectively set up a blueprint to authentically deal with any type of challenge in the long-term. Why would someone choose a coach versus a therapist? Coaching is distinct from other service professions such as therapy, as the philosophy is based on focusing not on the past, but on a roadmap from the present to the future. Nobody needs coaching, you need to want coaching. You need to want to change for the better, to transform, to strengthen and reach your fullest potential. If however as a coach we notice behaviors in our clients that suggest they may need to see a therapist, we always suggest this and may put a pause on coaching until the client is in the right place to start again. Coaching is also distinct from mentoring. Coaches don’t ever tell you what to do or feel, we help you find this authentic action, thought or feeling that is deep inside you and support you to act on it. Studies carried out on the brain show that when a person is empowered to come up with their own solutions, they have 'aha' moments that allow them to put their solution into practice successfully and for the long-term. What would a relationship with a coach look like? Coaches all work slightly differently, so it is important that you make sure you find the right one for you (also make sure they are accredited by the International Coaching Federation!). I work with individuals who are committed to transforming how they see themselves, expanding their world, and reaching their fullest potential as an authentic leader in their life. I have a holistic coaching style that focuses on the whole person, and I am a firm believer that every individual is the expert in their own unique life. My philosophy is informed by emotional intelligence theory, neuroscience and positive psychology and I focus on being your support system every step of the way - encouraging you but also keeping you accountable to your progress. My coaching engagements are for a minimum of 3 months and consist of weekly 1 hour sessions typically held over the phone, assessments and customized action-steps between sessions, and access to me via email, text or quick phone calls between sessions for support. Working through transitions authentically doesn't happen overnight but with time and dedication, it will happen!